My wife loves to read. I mean, she really loves to read. Not digitally though. She says flipping the pages and physically holding a book are part of the experience. No Kindle or tablets for her. This means we have a LOT of books in our house. Which is fine because she does read them multiple times and trades with friends and family who like to read as well. And because reading books is a lot less expensive of a hobby as woodworking I really don’t have room to complain. With a lot of books comes a lot of bookcases. This is the fourth bookcase I’ve made for her. The first bookcase was built a few years ago when we were living in an apartment so it naturally couldn’t be that large. The second and third bookcases were a 2×10 design built vertically seven feet. I thought that would be plenty of book storage but when they were completed and sitting in place for the first time she actually filled them up immediately with a couple books sitting on the floor. 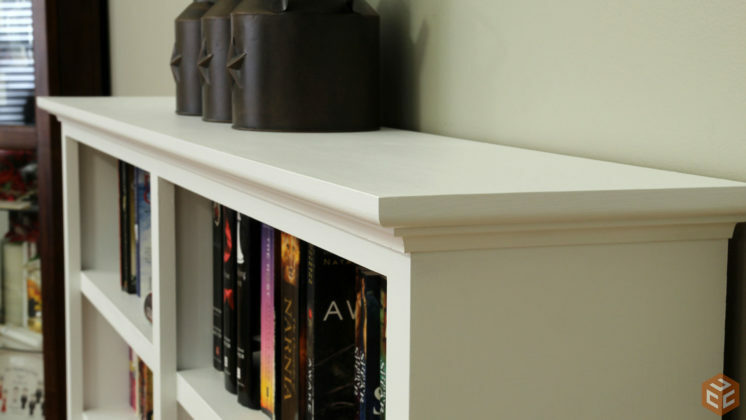 My design process with this one was to make something that would hold a lot of books but still look like a nice piece of furniture in the house. A complete hardwood project is a little out of budget at the moment so I decided to go with birch plywood and poplar and paint it white. The plywood I’m using is PureBond hardwood plywood. 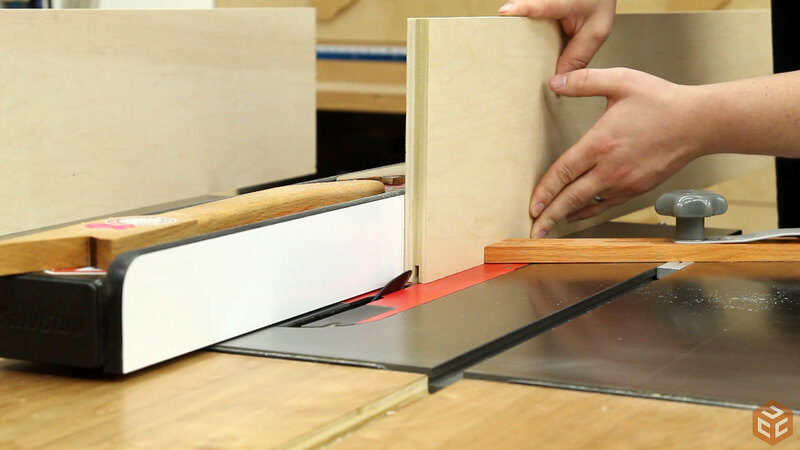 I’ve been using it since making my miter saw station and have had great results. And it’s made in the USA and formaldehyde free as well. The first step was organizing all of the materials to make sure I had enough on hand for the build. 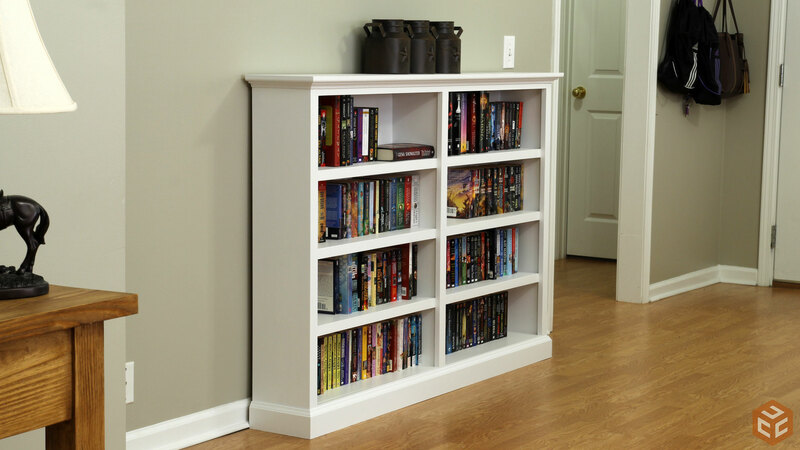 For plans to build this exact bookcase click here. The new shop layout has been working really well. 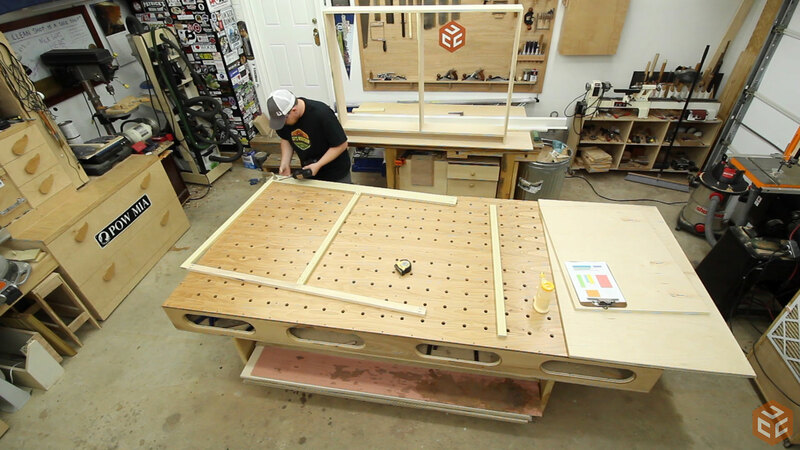 I now have access to all four sides of my assembly table. And because the assembly table, my workbench, and the table saw/oufeed table are all the same height it makes moving large materials from station to station really convenient. 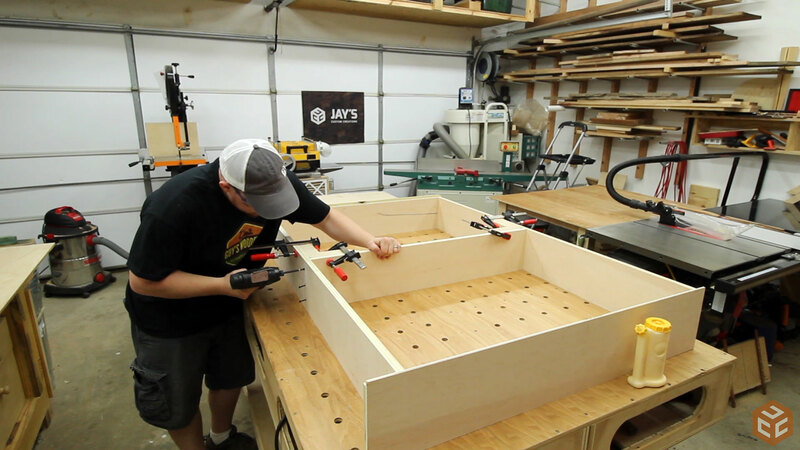 I started with cutting the plywood parts for the case. The new shop layout also makes it really convenient to use the over arm guard/dust collector on the table saw. I’ve been putting a lot more emphasis in 2016 on dust control and maintaining a clean working environment and this over arm dust shroud allows nearly dust free cuts on the table saw. When adding the back later on I don’t want the back panel to have the sides exposed. To hide it a rabbet needs to be cut on the side panels. 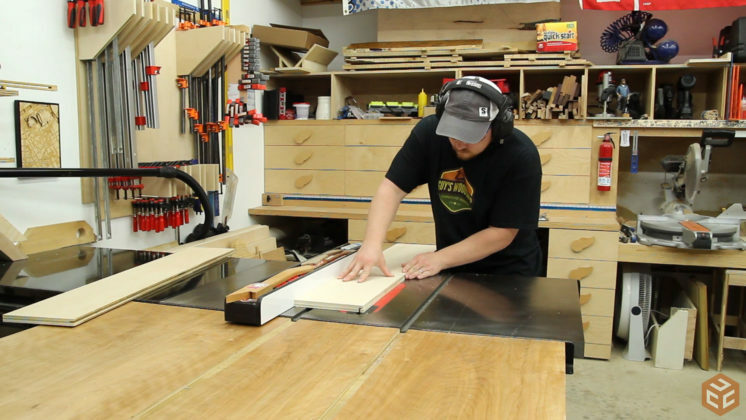 There’s many ways to cut a rabbet but I chose to do it with two cuts at the table saw. The vertical cut was first. Followed by the horizontal cut. Notice that I have the waste piece away from the fence. Any time you are making a cut that will release a waste piece you want to avoid having that piece trapped between the blade and the fence which will normally result in the waste piece getting shot backwards like a rocket. I chose to make the horizontal cut of the rabbet second as this will leave the fence in the exact location to cut the top, bottom, and vertical divider. Those are cut to width immediately after the rabbet. 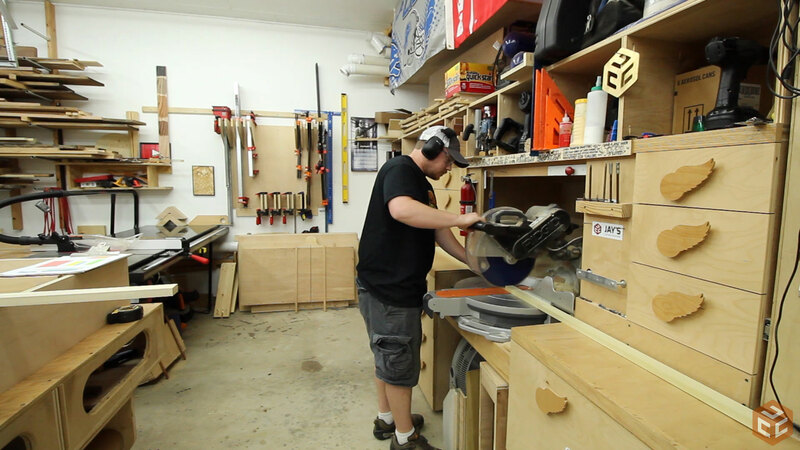 All of the case components are cut to length at my miter saw station. Having a dedicated crosscut station with a stop block in my current shop has been incredibly convenient. I highly recommend some type of setup like this. Again, the new shop layout shines when the assembly stage starts as I have access to all sides of the project without moving it. Because you will never see the top of the plywood top piece or the bottom of the plywood bottom piece I chose to use pocket hole screws for the main case assembly. In this picture I already have the left side attached and am working on the right side. It’s hard to see but I’m using the center divider as a spacer inside the case to locate the bottom panel. You will see both sides of the center divider so I chose to not use pocket hole screws there and instead screw right through the top of the top and bottom panels. Again, they will never be seen so the screw heads don’t matter. The face frame is next. 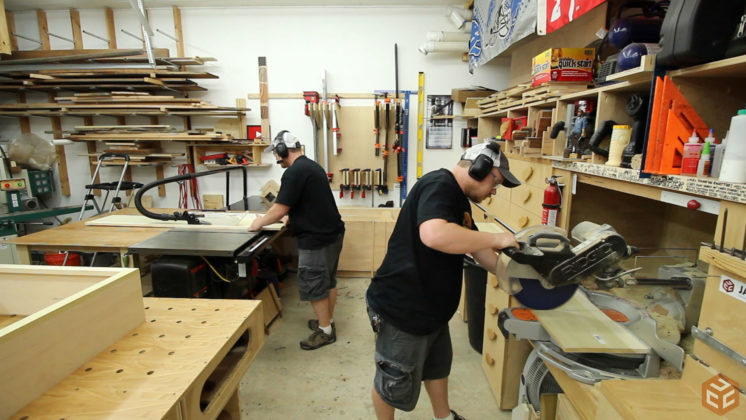 All of the components are cut to width at the table saw and final length at the miter saw. Although I am working directly off of a cutlist and layout diagram that I established in SketchUp it’s always a good idea to measure the exact project your are building rather than relying on predetermined dimensions. If you follow all of your diagrams exactly there shouldn’t be a discrepancy but if you’re off by 1/16” in the beginning than a few measurements might need to be adjusted accordingly as you go. So again, use your diagrams and plans to guide you and use your exact project to maintain accuracy. Pocket hole face frame construction is pretty straight forward. Cut, clamp, screw. I attached the assembled face frame to the case with glue and brad nails. Next up is the final top surface. For that I’m using a wide piece of poplar. It paints really well and will allow me to route an edge with clean results. 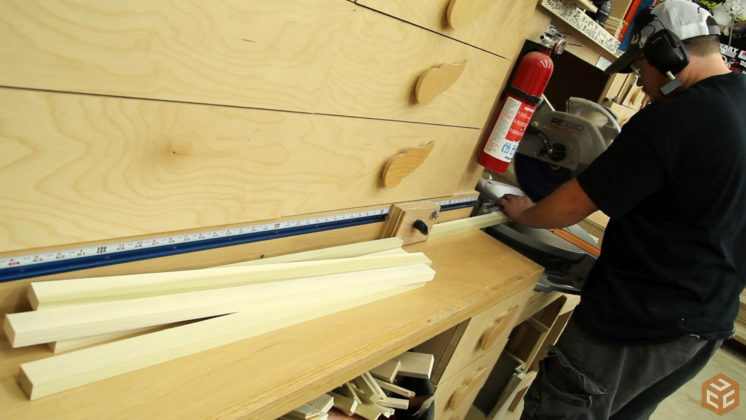 Again, cut to length at the miter saw and cut to width at the table saw. I used my small palm router to make a 1/2” round over on the bottom side of the top piece. For dust collection I have a shop vac attachment hot glued to the bottom of the edge guide. It works flawlessly. I don’t think an ounce of dust escaped this setup. To attach the top panel I used screws from below through the top of the case. Typically you wouldn’t want to fix a solid wood panel in place like this due to expansion and contraction but in this instance the poplar I am using is very dry and the entire piece will be completely covered with paint which will act as a moisture barrier. That will eliminate nearly all of the expansion and contraction so there won’t be any issues down the road. With the case still flipped upside down I started on the cove moulding. Just regular 45 degree miters. 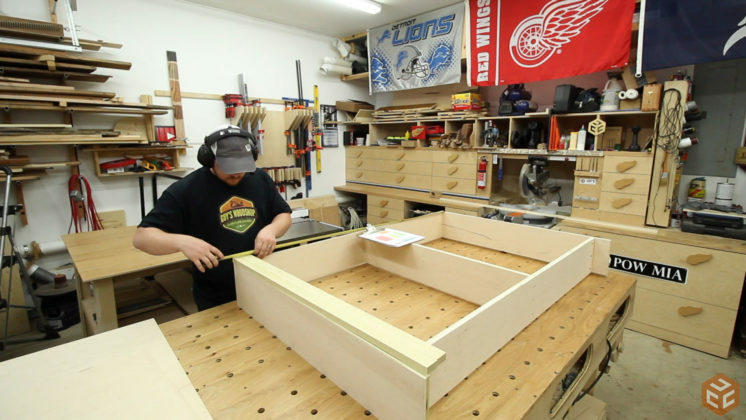 Lay the piece in place and mark the back side where the miter will be. 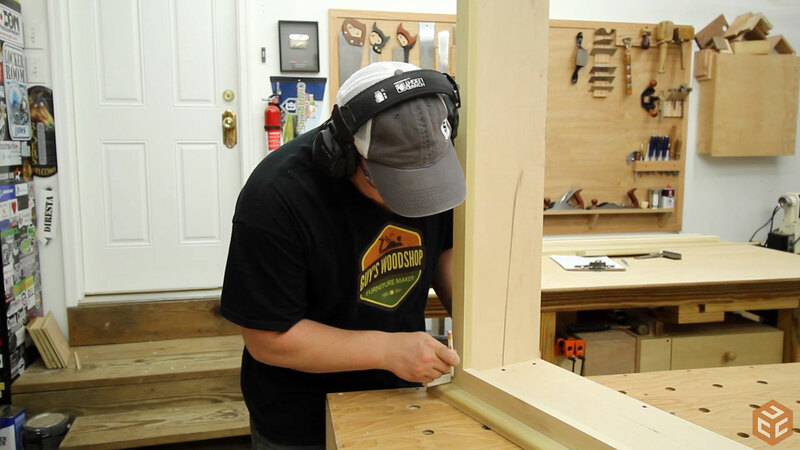 I like to sneak up on the miter by taking off a little at a time until I get a perfect fit. 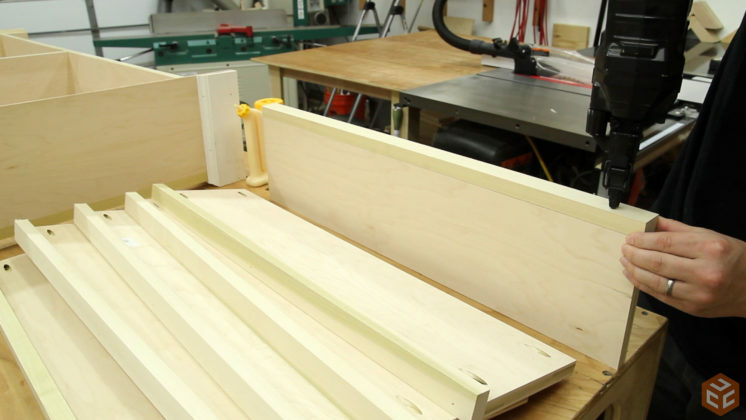 If I was using moulding that would be visible such as a stained or cleared piece of wood I would probably setup a sacrificial fence to be a little more precise with the cuts. Because this is going to be painted you have a little more leeway from perfection. That doesn’t mean you can make a crap product and cover it with paint to make it look good though. And the rest of the cove moulding can be applied. I used glue and a couple brad nails to attach it. 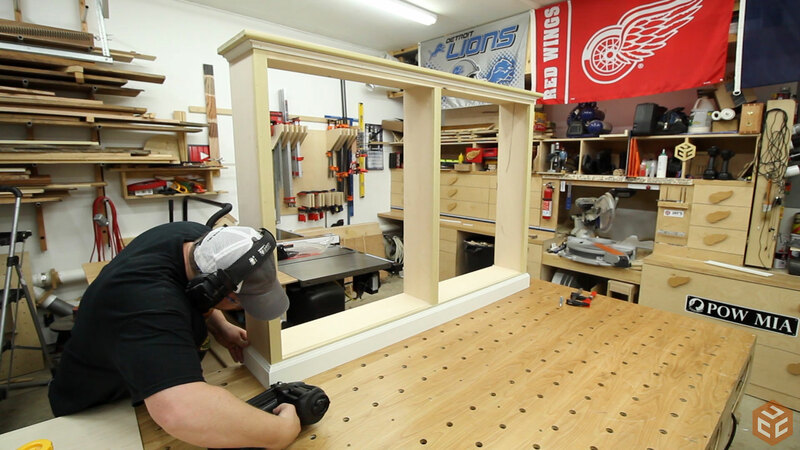 Flip the case over and install the base moulding the same way. The shelves are next. Six strips of plywood are cut at the table saw. Each one of the shelves also got two pocket holes drilled on each end for assembly later. A matching number of solid wood pieces need to be cut for the shelves. These will cover the end grain of the plywood. The solid wood edge banding is attached with wood glue and brad nails. If you prefer to not have to patch the nail holes you could also attach these with glue and pocket holes from below. Brad nail holes are easy to eliminate when painting so I went that route. 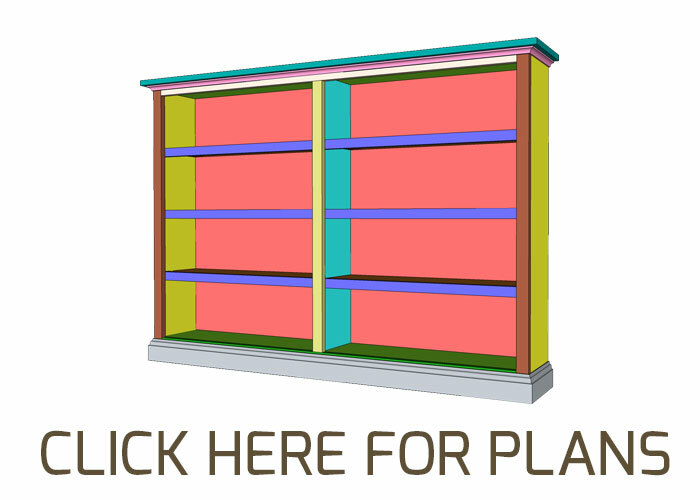 You have a choice of fixed shelves or adjustable pin shelves. I’ve found that every time I use an adjustable shelf system I never adjust the shelves. So I decided that putting fixed shelves exactly where I want them would be appropriate. I used a pair of spacer blocks to determine the exact placement of each shelf and attached them with a couple pocket hole screws on each end. The last piece of the puzzle is the back panel. 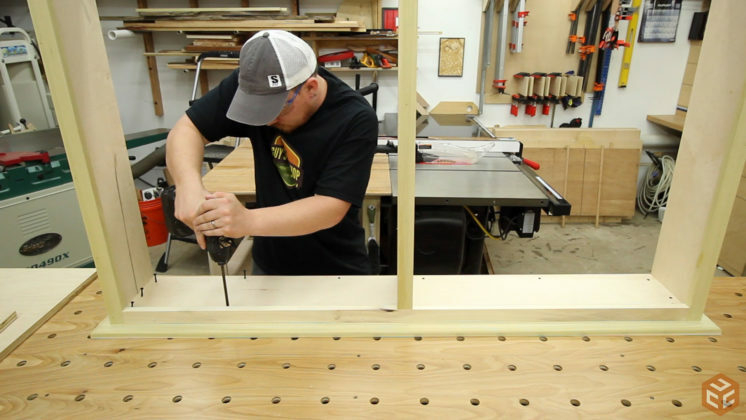 Once again, the new shop layout really increases convenience when cutting panels as I can use the assembly table edge for a little helpful material support. The back panel is secured with screws only. No glue is used. This is because I want to be able to take the back panel off when I paint. You could paint it and then permanently secure it but I like to build to completion to verify everything fits and then dissemble as needed for the finishing process. 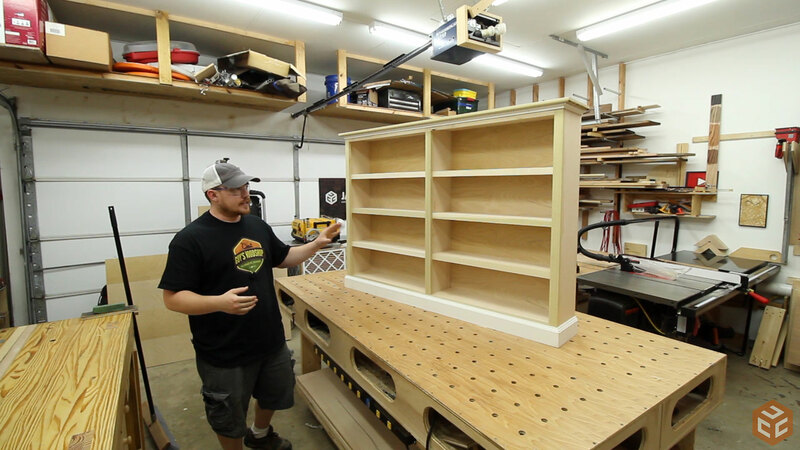 Here’s the completed unfinished bookcase. Quick and easy. I’m not going to cover every step of the finishing process as it’s incredibly boring and simple. Sand, apply first coat (primer if you want), fill nail holes and sand again, apply final coat. Super easy but quite boring. Here’s the completed bookcase all filled up and sitting in place. 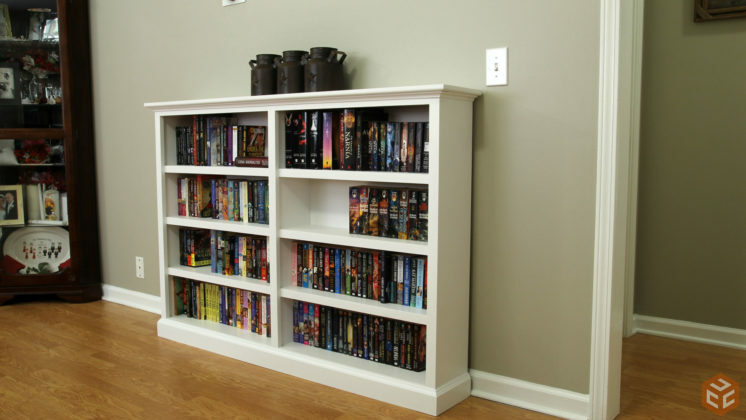 For plans to build this exact bookcase click here. 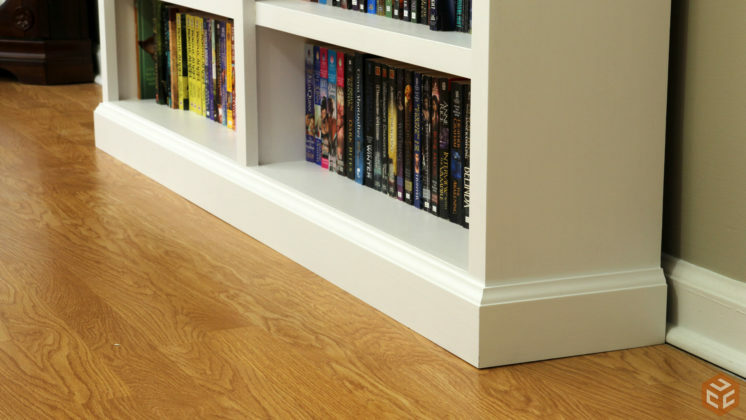 I NOTICED YOU DID NOT PUT A FILLER PIECE UNDER THE CENTER VERTICAL BOARD, I WOULD THINK THAT WAS A LONG SPAN WITHOUT CENTER SUPPORT, I WOULD BE AFRAID IT WOULD SAG A BIT WHEN THE BOOK CASE IS FILLED. OTHER THAN THAT I THINK IT’S A BEAUTIFUL WELL DONE JOB. It’s not necessary. 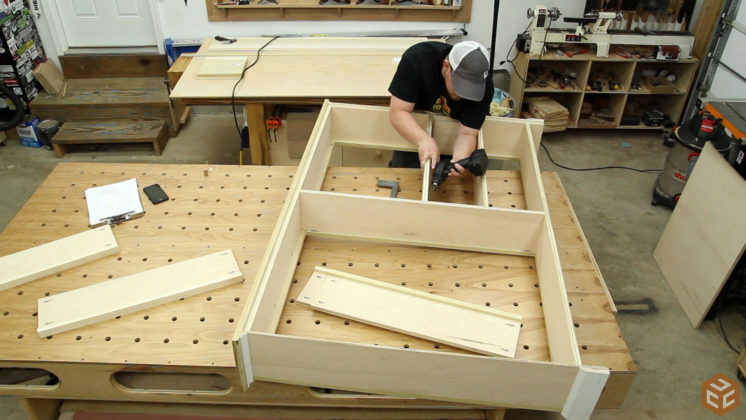 The lower shelf is glued to the front face frame and the rear plywood panel is screwed to it. Too much stuff holding it in place. No where for it to go. Great build Jay! The new shop layout looks like it is making you builds more efficient for sure. Love watching your videos. Keep up the great work. She has good taste in authors. I recognize a few spines…Martin, Robert Jordan. Oh…great build also Jay. I will definitely have to have a go at this project and get my books out of the Rubbermaid totes. most B&M stores have moved to only stocking water based latex which tends to be bad for these kinds of projects. Normally people recommended to me to just use oil based but in the video you mansion using a latex (water based). What exact brand and type did you use and do you recommend any other brands/types/time considerations/techniques for painting these kinds of projects to present such problems? I used Valspar Project Perfect latex enamel. I haven’t had a problem with items sticking. You can always top coat it with a clear water based non yellowing polyurethane. I have had the same experience John. Try different brands until you find one that dries hard. Even with 2 kindles in the family, we seem to be accumulating (i.e., overflowing) books. Oh well. The local library is less than 1/2 mile away, and has lots of shelves and book-sale tables. 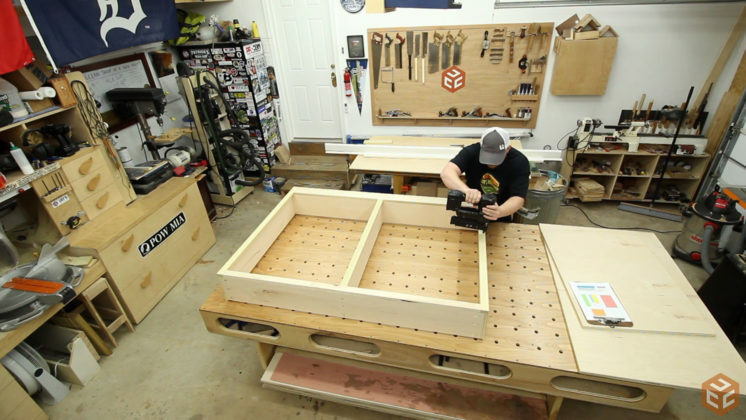 question: if this was a “budget build” and a painting project, why not make the face frame and top panel out of mdf? 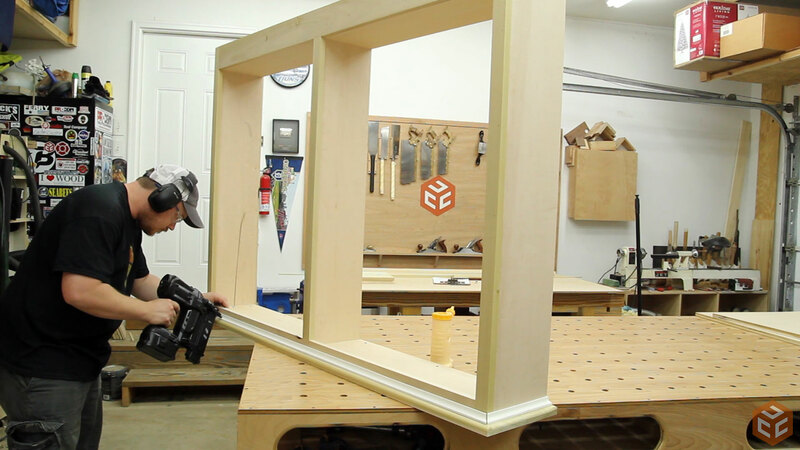 come to think of it… if whole wood is expensive – why not make face frames out of mdf in any painting project? MDF isn’t durable on it’s edges. Even when painted dings will break it open and it will deteriorate more quickly than just about any other option. The route I went with was a lot less expensive than purchasing solid hickory or something similar for the bookcase. Jay I was wondering about the plywood Pure bond from Home Depot. I have used some of it and found that the veneer is so thin and if not careful you can sand through it. Have you had any problem with that. Because of that I have gone to using plywood from Menards. 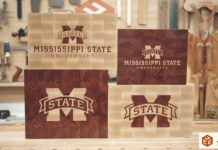 It is thicker veneer and also cost less, if you buy it when they have their 11 % rebate that makes it even less. You can use the rebate for other items you might need for your build. Not on to some thing that happened to me that has never happen in my 50 plus years of working with wood. I was cutting a piece of 1/4 ” plywood to the correct width and when it was past the blade I had a hold of it and tipped it up to pull it back to me I caught the blade and ended up hitting me in the stomach. It did not hurt me because I still had a hold of it and my had softened the blow. But scared me. And yes no blade guard on. I don’t think Menards is even in Mississippi so that route is out. 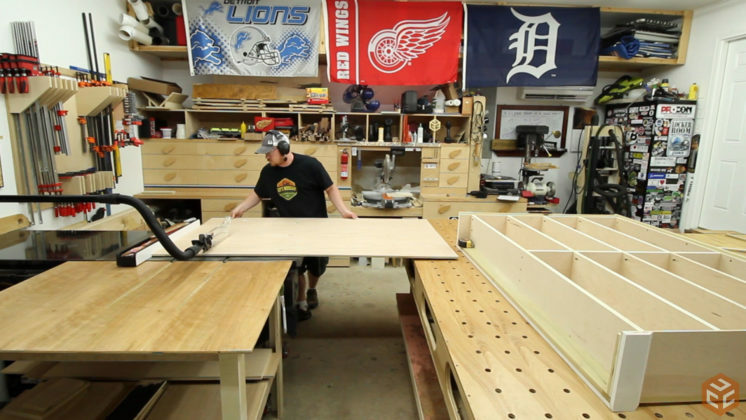 I never sand with anything tougher than 220 grit on the plywood and have never had any problems. 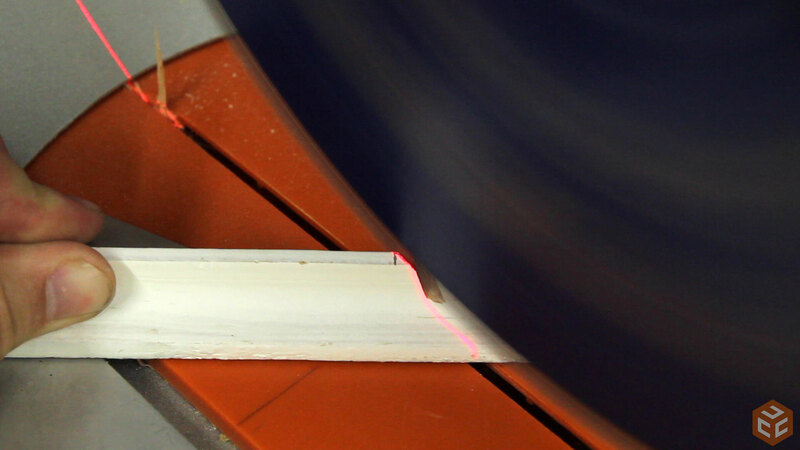 I’d say if you are going through the veneer you are sanding too aggressively. If trying to flush another surface with the plywood, such as the side of the face frame to the side of the case, I’d suggest using a block plane to remove the other surface rather than a sander as an electric sander isn’t easy to isolate to a small area. Nice clean construction and looks good! Wives mind the dust you drag in the house a little less if you keep them supplied with wood projects! -Why do you use battery powered Brad nailer instead of pneumatic? I have both, but use the comparatively bulky only in the field when I do not want to lug around the compressor. -I like the solid wood top for durability, but despite the paint you will get seasonal movement. 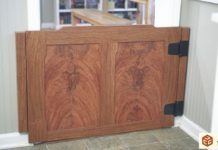 Think of solidwood door panels. I have seen many of these shrink expand, even with paint. Why should this be different? Perhas oversized or elongated screw holes would have been more appropriate? I have been in the trade for almost 40 years, but I still pick up some nice tips from you. 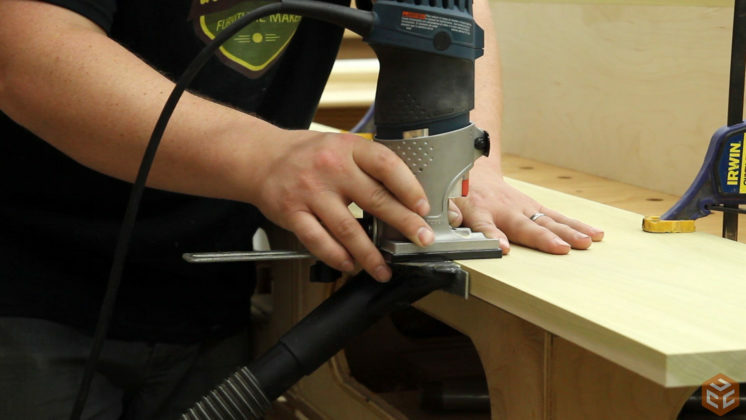 -While the battery nailer is a lot heavier than my pneumatic nailer I find it much more convenient to grab off the shelf rather than drag out the air hose and attach and with the battery nailer I don’t have to deal with the compressor noise. -It’s a situational answer I believe. The material I used was dry poplar which is pretty darn stable to begin with and it was sealed with a couple coats of paint. All wood will move but in this situation it won’t move enough to notice. 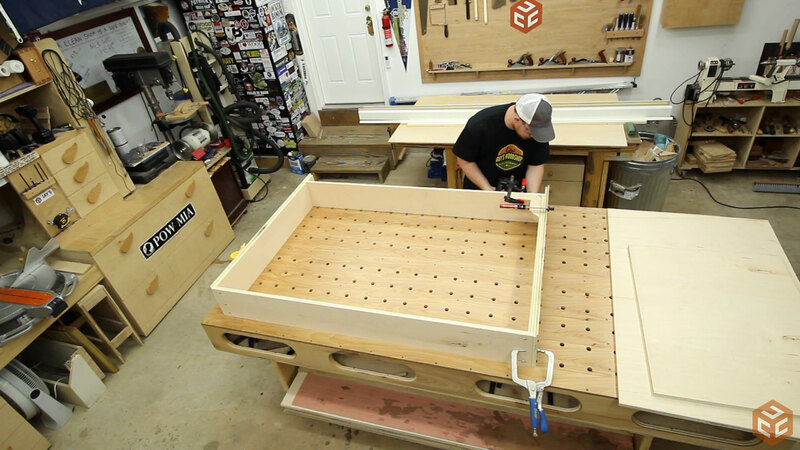 I’ve got a few other “one board top” projects in my house with identical circumstances that have been through 4 or 5 years of seasonal changes and I can’t see any visual signs of movement. 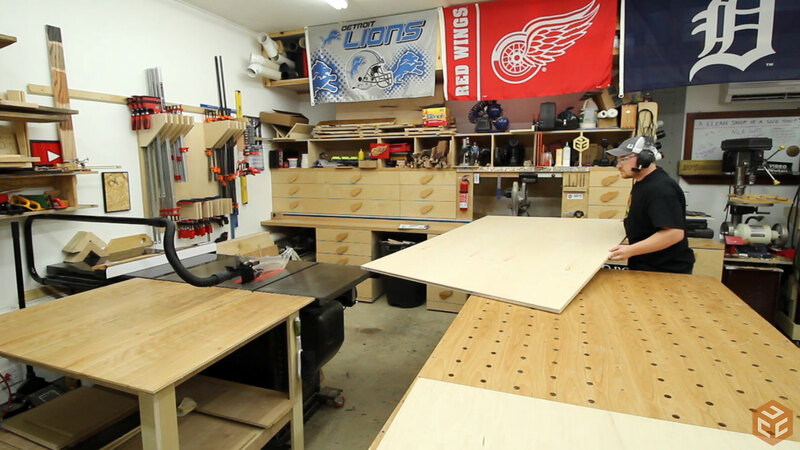 BUT keep in mind that these are small boards and not full table tops. Yes, wood moves. And there are times where you need to account for it. On this scale and the way it was attached I don’t think its a concern. Fantastic! Shared to FB and already wants to know when I’m building mine. 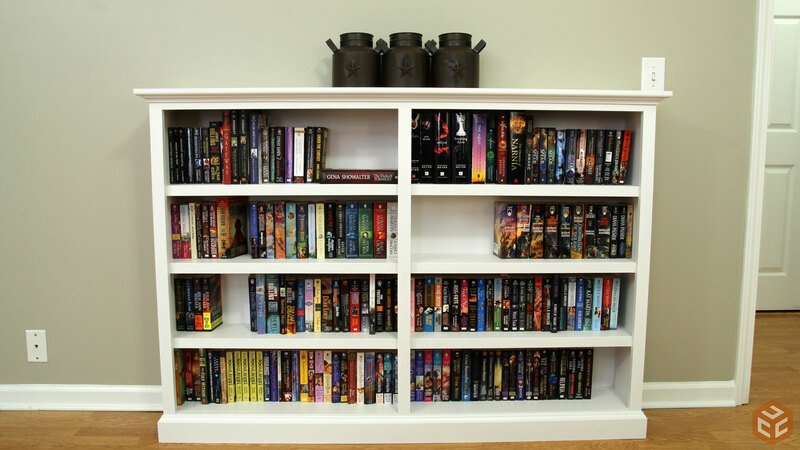 Though, I have the book collection and the woodworking hobby… Robert Jordan was awesome! Hey Jay… First time to your site, took about an hour checking it out, nice work! Nice shop too! 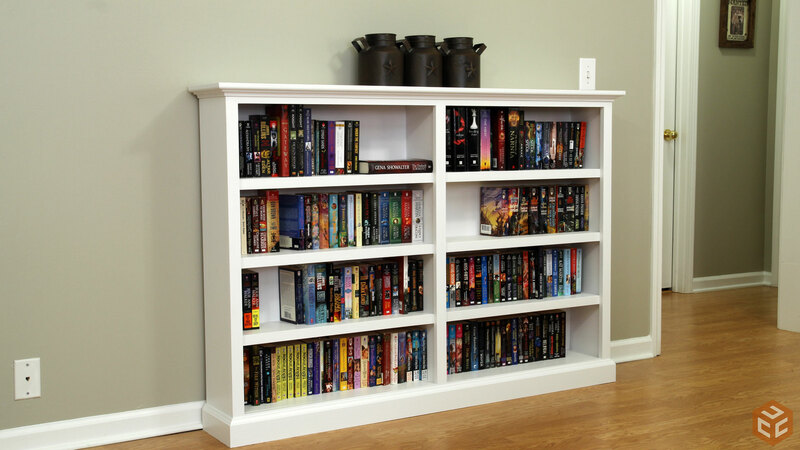 Nice size bookcase and design. The plans are simple, thanks for sharing! I was looking at your walk-through of the custom chalkboard and then saw this. As someone that is looking to make a bookcase just like in the future – this helps a lot. I love the detail and pictures you use to walk us through the projects. 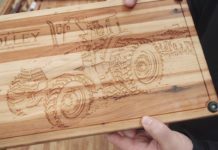 I struggle with woodworking so finding more about this subject and how to do it properly is great. 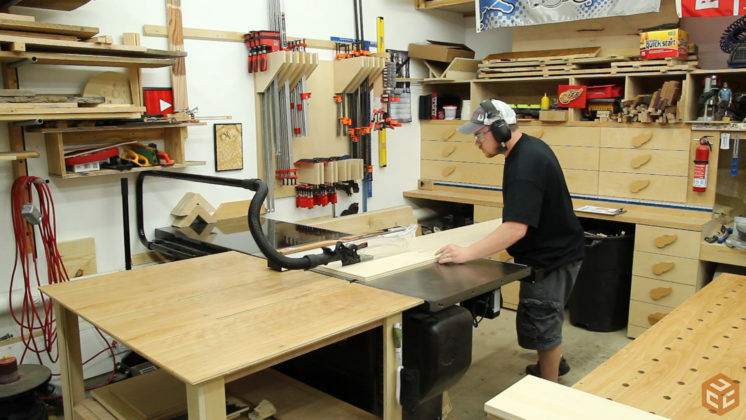 Also, congrats on how neat and clean the shop looks! I’ve been in shops that just have things kinda tossed in random areas. 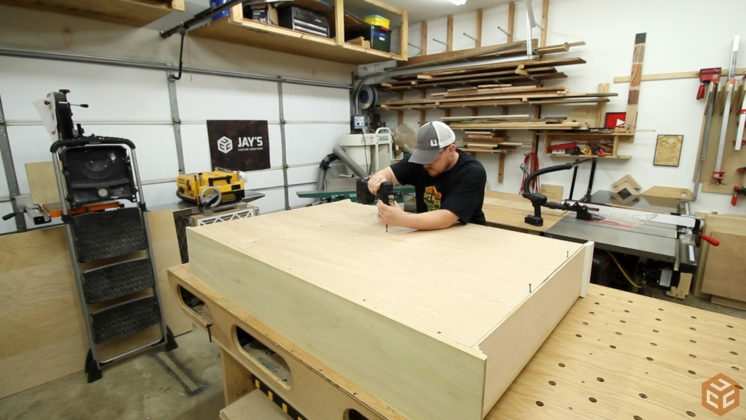 I have a much cheaper table saw (I am thankful for it, but scared of it), and any time I try to make cuts like you do at 6:03 in the video, it binds and either stops the blade or tries to shoot back at me. 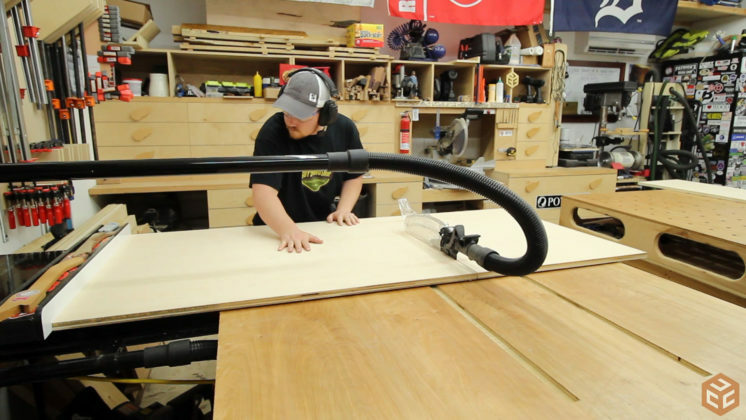 Is there something you recommend I add to my table saw that helps stop this from happening or should I just use a circular saw with a guide? That’s because your fence is not parallel with the blade. If it binds and kicks back that means the back of your fence is closer to the blade than the front of your fence. 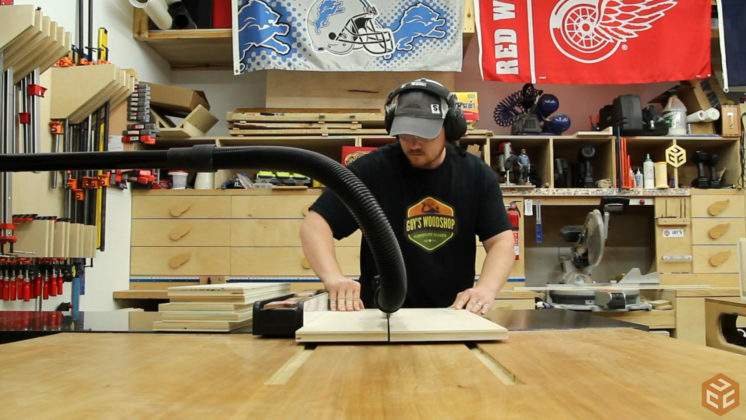 It’s incredibly dangerous to use a table saw that way. Make sure you measure the fence distance at both the front and back of the blade. Yes absolutely. I always measure front and back. But I have noticed in videos, something behind the blade, and I only have the blade. So I don’t know if it was missing something or if that’s after market. Love your videos and projects by the way. Great stuff. My saw never kicks back when I’m pushing material in the long side, only when I try it the short distance. So I just quit doing it.